Automakers are learning how to capture the imagination of a new generation of buyers by using the very popular social media platforms their new buyers are using. Mercedes-Benz has launched a brilliant new marketing campaign for the all-new 2014 Mercedes Benz CLA four-door coupe that will use the popular social media photo platform Instagram. There is a specific generation of buyers Mercedes is trying to target with the new campaign. To mark the introduction, Mercedes has chosen to use classic advertising measures such as print ads and TV spots. But the new CLA will also feature an online special aimed at stimulating the creativity of participants. The all-new 2014 CLA four-door coupe will be featured in a new promotional campaign under the slogan "Untamed. The new CLA." The new CLA features a new “internationally unique aerodynamic design”, that Mercedes will attempt to capture the attention of a new generation of global buyers with. The new campaign theme of “Untamed” is aimed at “breaking free of the constraints of convention to become the leader of the road-going pack.” Mercedes marketing activities will focus on the unconventional, self-assured and sporty image of the new 2014 CLA four-door coupe. The car is already unconventional with its sporty coupe-like look, and the price point is aimed at capturing a younger customer who is not your ordinary Mercedes buyer. "The CLA will be in a vehicle class of its own. As the little brother of the CLS, it will appeal to target groups who bring a certain non-conformist approach to life. The campaign therefore puts the car in situations that can be summed up as 'Anything but ordinary'", according to Anders-Sundt Jensen, Head of Brand Communications Mercedes-Benz Cars. 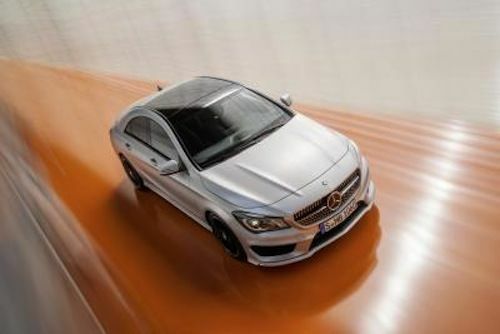 Mercedes will also feature unique limited edition models like the 2014 CLA Edition 1 that will be exclusive and enticing. The new 2014 Mercedes CLA stands out from the crowd with its sporty design and dynamic handling characteristics. Mercedes will try to draw in a younger generation by using some surprising images and TV spots that ask the question, how is it possible to stand out from the crowd, when so many others are also striving for individuality? And of course the answer is provided by the new CLA. The most unique part of the campaign will use an unconventional online and event format exploiting the power of the popular social media photo platform Instagram. The program will launch in February and is a a digital photo installation inspired by the new Mercedes-Benz CLA. Users will be able to upload the most unusual images from their personal Instagram photo stream to the multivdevice-compatible CLA campaign website. Participants will be able to see how individual their photos are, and the extent to which they stand out from the images captured by other participants. The brilliant campaign gets potential CLA buyers to break free from the constraints of convention, and demonstrate their creativity using the central theme of "The natural enemy of the ordinary." Then taping into the very social media these new consumers are using to stay connected, a poster of the personal pictures can then be downloaded, sent by email or shared with friends via Facebook, Google+ and Twitter. In April, the personal photos will then be digitally reworked, and together with the Mercedes-Benz CLA, incorporated into a photo installation to be presented to an international audience in Paris. Mercedes has chosen a brilliant marketing campaign that will appeal to the very generation of buyers they are trying to attract. The new 2014 Mercedes-Benz CLA will be available from authorized dealers from April 13, 2013 in Europe. Users can go to www.untamed-installation.com to upload their images from their personal Instagram photo stream.